4.) What are their accomplishments? Does these accomplishments match their vision? As always, please make sure to use reputable sources and cite all of your work. The charity that I am interested is the Earth Ranger. They are a kids’ conservation organization with a vision to instill environment knowledge, positivity and the confidence to take action in every child (1). In other words, they want to inspire thousands of children each year to participate in a movement to protect animals and their habitats (1,2). They also teach them about biodiversity (3). Nonetheless, their accomplishments include their various programs. Such programs include their Earth Rangers' School Outreach program (1, 4). 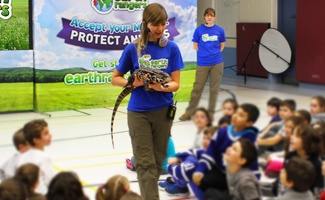 In short, this program does 45-minute presentations during assemblies or classroom visits to advocate for the protection of biodiversity and highlights various conservation initiatives in Canada. They visited 873 schools, including 107 French-language schools and 27 Indigenous schools, in 2017 and reached 252,277 students (4). Moreover, they also have the Earth Rangers Foundation’s Membership program (1,4). This program, on the other hand, have children sign up to be an Earth Ranger and provide them with activities such as conservation projects (4). Furthermore, they have the Earth Rangers’ Missions program which are short-term assignments for those members/Earth Rangers (1,4). Such assignments include recycling batteries, shoreline clean-ups, etc. They also had a program called the Earth Rangers’ Bring Back the Wild program (1,4). This is a campaign to teaches the importance of protecting animals. Here, they protected 33 different species. One specific example of this is how they helped protect the American badger in Southern Ontario. They had done field restoration and created sand ridges to help improve the American badgers’ ability to find food and build dens. In this project, they also got radio transmitters on several American badgers to better understand their movements. There were 8,000 campaigns (1). 1. Establish the legal right for all Canadians to live in a healthy environment. 2. Accelerate the transition to a low-carbon future. As you can see from the above chart, 75% of their revenue is used towards a variety of different environmental programs which is around $7,279,656. (4) Just this past year, the foundation made $9,706,208; however, they dropped compared to the previous year before hand. Securing Environmental Rights- Alongside the Blue Dot Movement, the foundation was able to get the federal governmental to review proposed changes for the Canadian Environmental Protection Act. In hopes of providing clean air, water, safe food and a healthy ecosystem, they were able to get 110,00 people to speak their voice about the problem in letters, petitions and many online videos. Natural Systems - The foundation persuaded the government to consider allowing communities to include natural infrastructure in their decision making which means there are lower costs due to letting nature doing the work. With a 3.2 million budget for the first time, the environment could be helped way more with natures help instead of placing more water treatments. Overall, the David Suzuki Foundation's mission and vision align with their accomplishments because their main goals were (Establish the legal right for all Canadians to live in a healthy environment, Accelerate the transition to a low-carbon future and Protect and restore nature.) By securing environmental rights, it will allow everyone to live in a healthy environment and maintain it for our future children to enjoy as well. The persuasion towards natural systems are protecting nature and moving towards a low-carbon future along with the protection of the Gulf is protecting the beluga whales who have lived there for many years. The name of the charity I chose to do research on is Education without Borders (EwB). Their total expenditures (programmes, general and admin expenses) was $87,514. Their total assets were $334, 762. They had no current liabilities. In conclusion, Education without Borders’ accomplishments do seem to match their vision and statement. They have reached hundreds of children in South Africa from grades 1 to 11, providing them with educational opportunities through after-school programs which have shown to considerably increase their scores, particularly in math. Project HOPE's mission statement is "We believe in a universal right to be healthy and thrive, and we envision a world where everyone has access to the health care needed to reach life’s full potential." We charity, formerly known as Free the Children before they expanded their projects and visions. I am interested in We Charity because it’s something that I raised money for in middle school, but I’m still not sure if they are a sustainable and honest charity. They claim to be raising money for various massive global problems, such as providing education, water, health resources, and nutrition to developing countries, but some research is required to make sure they are having an impact. We Charity uses 90% of donations on project-related activities and 10% of donations on fundraising and administrative costs. They do not only receive money, but they also accept goods and supplies, in fact 25% of their donations are supplies used for their projects (1). Personally I believe that these accomplishments show that We Charities are staying true to their goal. Not only are they trying to make an impact, but the charity is also based on giving students the opportunity to make a difference. Canadian an American teachers involved in the program all took a survey, and 92% of them said that after their students participated in this they felt a stronger connection to their community and 89% said that the students are more likely to stand up for others (2). I find that really cool, because that means that they are impacting the lives of people in developing countries and students that want to make a difference. In conclusion, I think that We Charity is a good organisation and is worth sponsoring. For my charity, I have chosen to focus on the Canadian Mental Health Association, an organization that "provides mental health promotion and mental illness recovery-focused programs and services for people of all ages and their families." (1) That is, they are dedicated to not only educating about mental health and mental health illnesses, but also to providing services for individuals who are struggling with mental health issues, looking to improve their overall health or build resilience, or who aim to support those they care about. They offer a variety of programs and services to promote better mental health in Canada. They also have a training program to prepare individuals with skills to help those at risk of suicide. As you can see, they spend a large portion of their funding on things other than their programs. This could be seen as deceiving or an issue, but maybe it isn't a bad thing. They're investing a lot of money into ensuring that the charity itself is run well, efficient, and well-advertised. In conclusion, I would say that yes, their successes have aligned with their goals, but it's difficult to quantify the degree of success they have achieved. I am interested in the foster kids charity. This organizations mission/goal is to better the lives of children in foster care. Their first priority is making sure that kids have the basic supplies needed ie. : Clothes, food, school supplies, hygiene products and so on. They want to educate their volunteers about the foster care system and improve the lives of those in it, and with awareness they believe in their goal of increasing the number of adoptions from the foster care system. This is a fairly new charity situating in Texas that was founded in 2010. It is a non-profit organization founded by Michelle Armour-Brown. In 2008 when she witnessed a horrific car accident of a family who had 2 foster kids. Terribly, no one survived and Michelle was left doing CPR on one of the girls. She then did research on the foster care system and decided to found the charity 2 years later. This charity provides help in different kinds of ways than the most common way of raising money. They provide 500-1500 food bags per month to foster children in state care, bring items to foster children, the foster families and agencies who care for them, host events for foster children, provide support for foster teens and provide funds for summer camp and after school activities for foster children. $50.00 covers the cost of 2 emergency bags upon removal of a child. They do mention all their sponsors, companies such as: Costco, ticket to dream foundation, delivering good and more. These are the organizations that help with things such as providing supplies and supplying food bags. They mention 5 other people by name who probably donated either money or items to help. (1)(2)They don’t directly say what they have accomplished, but it is also a fairly new charity, but in that little time they have 9 different companies/organizations helping them, an article in WE magazine supporting their cause, donating 500-1500 food bags a month and more. (3) however as good as the website seems, this site claims that it has a very low PageRank and not “socialized” very well. It has no visitor reviews but is said to be a safe website to use. (4) According to 3 reviews on this site, this charity really helped all three of them. They helped providing toys, connecting with the kids and providing necessary supplies. So according to this, I would say they have met their vision very well. Seeing as it is still quite new, there are not too many reviews, however from the ones that I have seen, it seems as though they are doing good on what they say they will do and they just need some more publicity to get the message out there! The charity I am interested in is Greenpeace Fund. They are the world's leading independent, environmental campaigning organization. In fact, they were founded here in Vancouver in 1971! (1) Their organization envisions the fact that us as citizens, have a moral obligation to take action against the injustices visited on our planet, in a nonviolent and appropriate manner. (2) Greenpeace investigates, documents and exposes abuses of power and to force the solutions which are essential to a green and peaceful future. The charity's main goal is to ensure the ability of the Earth to nurture life's in all it's diversity . (3) The money raised from this charity is primarily used for contributions to other countries in the world that need our help, gifts and grants. According to statistics, 100 % of the primary revenue is contributed on programs they tend to deliver for our earth. However, around 83.4 % of the revenue is spent on expenses of this factor. On a yearly basis, the non-governmental environmental organization raises approximately $19,500,000 on average and receives an estimate income of $255,000 from another source of revenue. Researching through different sources to learn more about this charity, I have learned some pivotal moments for this organization and what they have come to achieve over the course of 40 years and how it all matches to their vision ! (1) In 2017, Greenpeace fund helped to win some human rights, ocean and forest protection, water safety and our climate. In 2014, Greenpeace supporters helped to bring the ice-strengthened vessel, the Arctic Sunrise, home. Supporters, allies, and friends also took to the streets to protest for climate justice and helped transform the supply chain of one of the largest, most well-known companies in the world and drew important attention to the dangers happening in our oceanic waters. As this is a few accomplishments they have shown, this demonstrates their vision of what we, civilians, can do with the power of solely people. The goal of the union of concerned scientists is to better the world through research and science (2), what they want is more political choices to be based off of scientific data (1). Their mission statement though is: “The Union of Concerned Scientists puts rigorous, independent science to work to solve our planet’s most pressing problems. Joining with people across the country, we combine technical analysis and effective advocacy to create innovative, practical solutions for a healthy, safe, and sustainable future” (1), or "to develop innovative, practical solutions and to secure responsible changes in government policy, corporate practices, and consumer choices." as stated when the charity was created (3). If we were to go off of what they themselves say, then 72% comes from membership (in their case when you make a donation you become a member of the charity), and contributions. Another 22% comes from foundations and the remainder planned gifts (1). In the last year, 2017, they got approximately 37.3 million in total revenue, and spent 25 million on programs, 1.3 million on administrative expenses and 6.3 million on fundraising (4). It also had 4.6 million in extra left over and was left with a net asset of 45.7 million (4). Of the 25 million dollars spent on programs 10.7 million went to their climate and energy program, 7.4 million went to their global security program, 4.4 million went to their center for science and democracy and the remaining 3.7 million went to their clean vehicles program (4). 4. What are their accomplishments? Does these accomplishments match their vision? They challeged a decision by the EPA to push back the clock on when new chemical safety regulations were supposed to come into effect. The new rules were supposed to go into effect on march 17 2017, but the EPA pushed the date back to February 2019, and so UCS and a few other charities challenged the change, and won, so the implementation of the new regulations could no longer be delayed. This matches up with their goal, as the new regulations where made after a year of looking into what was needed and then they were given 2 years to make sure they can follow the regulations and then they would be in place (a few were supposed to be more faded in as they would take more time and were planned to be in place by 2022), so it follows their goal of changing the world positively with logical and factual solutions. Another accomplishment is their help in getting SB 100 passed and signed. SB 100 is a bill for California stating that they accelerate their renewable portfolio standard to 60% by 2030 when before it was only 50%, but more Importantly it makes it so that by 2045 they must have 100% of their energy being carbon-free energy, such as wind turbines. This does also match their goal, of getting solutions to problems we have, In this case carbon-free energy to slow down climate change. There is a website (2) which is the link to homepage. A brief idea of what they do that weaves into their mission and vision is being the leading general or specialized pediatric services. (3) In terms of their mission, statement and vision, their mission is finding results through caring, leading and learning together. Vision is finding province wide solutions for excellence in health, consistently. These accomplishments out of the many other is reflective of their missions, values and vision. They are providing the best care they can provide, developing research and maintaining a sense of respect, compassion, and more for children and the medical world. I learned about the WE movement last year in grade eight at Banting middle school. We did bake sales to raised money to help children in other countries to get clean water. At the time I did not question if they were a sustainable and honest charity. I did not known much more than that the good thing “the icing on the cake” that teachers have fed me. I saw a number of positive videos on what WE is doing and wanted to dig deeper. I am curious to see what's inside that cake. To work with developing communities to free children and their families from poverty and exploitation. WE Charity states that it is committed to delivering a sustainable development model that empowers people to empower themselves, their families, their communities and the world. On there website they claim to be raising money to address global problems, such as providing education, water, health resources, and nutrition to developing countries. (2) Of course some research is required to make sure they are having an impact. ME to WE Corporate partners. For example the Me to We school supplies at Staples. Local fundraising by youth in schools and the community. For example bake sales. We Charity uses 90% of donations on project-related activities and 10% of donations on fundraising and administrative costs. I believe We Charities are reliable and standing strong to help children around the world as well as staying true to their goals. Not only are they trying to make a difference, but ME to WE is also giving students the opportunity to make a big difference. The WE movement is not just working on the physical impact but also giving hope to these children. Canadian and American teachers involved in the program all took a survey, and 92% of them said that after their students participated in Me to WE they felt a stronger connection to their community with 89% of the students are more likely to stand up for others (1). This shows the positive impact on these children, how they are more focused as well as enriched in their values which to me is very important. I find that this is really amazing and even inspirational, because that means that they are impacting the lives of people in developing countries and helping students to be able to make a difference. Teaching the values of working together may even help countries develop in a healthy non corrupt way. In my conclusion after thorough research I conclude that the cake is good, WE Charity is good, loyal to its cause and a positive organisation worth sponsoring. The Sickkids Foundation’s mission is to save lives, to find new cures and to provide world-class care. But they are also fighting against the limits of a 70-year-old hospital where parts of the building don’t meet modern building codes. Where the most vulnerable patients are crammed into overcrowded rooms. Where the outdated spaces can’t accommodate the weight of an MRI machine. That’s where we come in. They need us to be on their side in the SickKids VS Limits Campaign, the biggest fundraising campaign in Canadian health-care history, to help build a brand-new hospital. Sickkids says “Our vision is simple: Healthier Children. A Better World. We believe fighting for the health and well-being of children is one of the most powerful ways to improve society. We need to expand our reach, to extend our excellent standards of care to more children around the world. We need to elevate our research - it’s our best weapon in the fight against disease and congenital childhood conditions. And we must enrich the compassionate care we believe fosters the lifelong well-being of children and their families. This foundation has many different ways to donate but most convenient and most successful donations were through online. At SickKids, every patient is being asked to grow up faster than they deserve. And every family member is being forced to witness that struggle. This is why Sickkids needs our monthly donors. The donations they receive fund brilliant doctors, nurses, and researchers. They support landmark surgeries and essential equipment. And they fuel our ongoing fight for our patients’ childhood. With already 700 million dollars raised they have reached just over half of their goal since 2018. They also have many other accomplishments that entail a myriad of different things. In November 2019 the first of two buildings are opened. The first will house the SickKids Learning Institute with 1,200 world-class trainees, a Simulation Centre for hands-on teaching, and provide our 6,000 professionals, management and support staff with up-to-date spaces to do their best work. The second building will house our critical-care and inpatient units, adding 437,415 square feet. It will reflect the very latest in medical design: private one-family rooms, dedicated mental-health beds, a state-of-the-art blood and marrow/cellular transplant therapy unit, specialty operating theatres, advanced diagnostic imaging facilities, and a vastly expanded emergency department. In Ontario, newborns requiring surgery or sustained life support can only be treated at SickKids. Right now, families are crammed into our outdated space, where they have no privacy to bond. The space needs a drastic update to improve infection control and make space for smart technology. In the new building, they will double the beds for critically-ill newborns, creating comfortable private rooms for families to care for their babies. They will add modular walls and flexible electrical writing so that life-saving equipment doesn’t hinder staff or families. We will bring diagnostic machines to the bedside so these fragile patients don’t have to be moved. SickKids performs 50 per cent of all bone marrow transplants in Canada, often for critically ill cancer patients. But the outdated rooms don’t have up-to-date filtration systems to keep out infections, and patients are forced to use in-room commodes because they can’t leave to use the bathrooms down the hall. SickKids treats patients from rural Ontario to Haiti, performing complex surgeries unavailable where they live. But the outdated surgical rooms can’t support the latest technology. In the new facility, they’ll build better rooms for robotics, with less invasive, even incisionless surgeries.